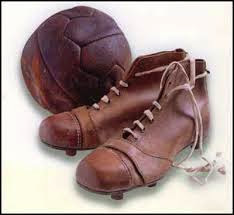 In the early days football boots weighed approx. 500 grams when dry and twice as much when wet. 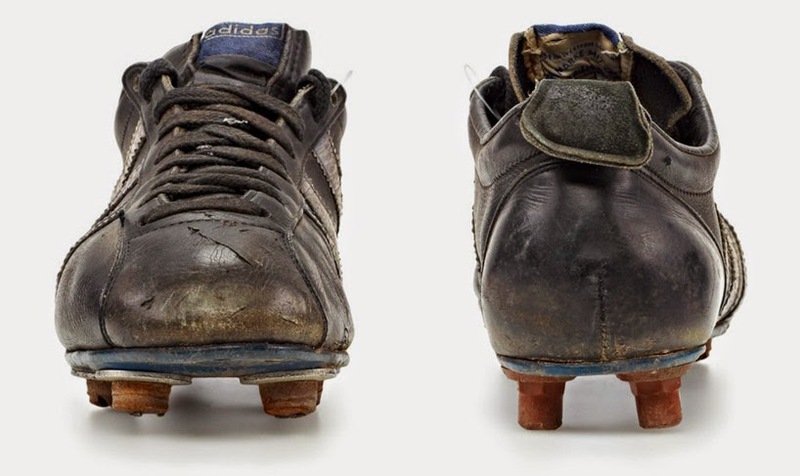 Manufacturers when made aware player’s boots were only in contact with the ball for about 10% of the game developed less heavy boots. Lighter footwear meant players were less exhausted and subsequently the overall speed of play increased. This made for a more enjoyable spectator sport. 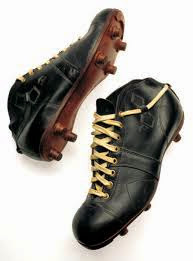 By the early 50's the soccer boot was streamlined with the ankle hugging component reduced to below the malleoli (ankle bones). Initially this met with some concerns about ankle injuries but proved ill founded. The traditional soccer boot was now a slipper or soccus. Leather soles were first replaced by molded rubber, then injection molded PVC, before nylon and plastic prevailed. The new synthetic materials were waterproof, cheap to produce and substantially lighter than leather. The upper of the slipper became thinner and improved treatment of leather with synthetic waterproof compounds contributed to the development of the new styles. Development of latex foam, meant the soccer shoe could be cushioned with no detriment to overall mass and new lightweight synthetics were stronger and harder wearing than traditional soles. By the 60s the overall weight of the new era of boots dropped significantly. 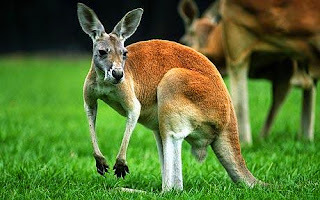 The physical properties of kangaroo skin were recognised very early in the 19th century and most quality sports footwear was made from marsupial's skin. This tradition has quietly continued in soccer shoes and now most quality shoes are made from medium brown, vintage kangaroo leather. This is a name given to the process of tannage (preparing the leather) and often the leather is dyed to popular colours. Kangaroo hide is the toughest and most durable available and been used to produce quality sports shoes for rugby, American football, baseball, basketball, tennis and cycling shoes for over a century. It is lightweight yet very strong and many times stronger than the same thickness of cowhide. Comfortable and supple it requires no break-in period and gives the player a tight fit with optimal feel for the ball. Suitably treated Kangaroo leather is favoured because of its high performance nature. Kangaroo leather has a naturally high strength-to-weight ratio. In the 80's, Australia's CSIRO undertook independent tests which confirmed these findings and determined that, when shaved to 20% of its original thickness, kangaroo leather retains between 30% and 60% of its original tensile strength, as compared to a retention rate of 1% -4% for calf and bovine leathers. In a further study by the CSIRO, it was found that kangaroo leather was at least 50% stronger than goatskin gloving leather in tear strength and puncture resistance. Microscopically the hide displays high uniform orientation of fibre bundles in parallel with the skin surface. The skin of the Kangaroo does not contain sweat glands or erector pili muscles, which would weaken the skin surface. The yellow elastic fibres (elastin) are evenly distributed throughout the skin thickness which gives the leather greater tenacity. These properties remain even when the leather is split. Tanning further enhances the leather's properties by unsticking the fibre bundles thereby allowing them to move independently. From time to time animal rights activists have brought the use of kangaroo skin to the public's attention by condemning players like David Beckham, who initially endorsed their use. Reputable firms collect kangaroo hides during the Kangaroo Harvest and agencies such as Environment Australia - Wildlife Protection regulate and control the harvest and manufacture of all kangaroo leather. There are several tyoes of kangaroo and only non-endangered species can be used for the clothing industries. Public concern however encouraged development of the pleather industry and many top quality boots now incorporated plastic polymers as an alternative to animal leathers.